The 1950s ‘Retro Style’ is back in town in the refrigerator space. With that also come bright colours – think fire engine red, cool blue, black and even the Union Jack. Perhaps we feel like we’re born in the wrong era or envy our ancestors who had more colourful appliances back in their day. Nevertheless, the range is here with slightly more advanced features than what was available in the 50s, but it comes with a price. Read on for a review of retro refrigerators available in Australia. Smeg is synonymous with the iconic retro-style fridge. It has by far the most variety of colours on offer, from red and yellow to blue and green, as well as simple white, grey and black. 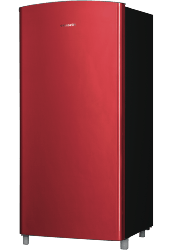 There are also several size options available including 473L, 326L, 256L and 135L bar fridges. Expect features such as automatic defrost, quick chill crystal glass shelves and chromed wine racks. The Smeg 326L, 1950s Retro Style Aesthetic Bottom Mount Fridge (FAB32RBLNA1) has a 3.5 star energy efficiency rating, using 323 kWh annually. The Smeg 473L (FAB50RAW-1) model brings a 2.5 star energy rating and is stated to use 477 kWh each year, which would cost you around $144 in electricity usage, according to the Standard Test. Prices in the Smeg retro fridge range start from around $1,700 for the small capacity bar fridge and max out at closer to $3,300 for the large capacity models. However, for the special edition 256L capacity 1950s style fridges, expect to splurge out almost $5,000. Smeg is also on board for retro dishwashers, so if it’s within your budget, you can deck out your kitchen in full retro style. The Hisense 157L bar fridge (HR6BF157R) is said to be a “happy medium”. Part of the Hisense Art series, the range is available in Bull Red, Graphite Black and Burnt Orange, to compliment any space. Features include an adjustable glass shelf, temperature control, as well as a fruit and veg crisper. It’s rated three stars for energy efficiency and comes with a $499 recommended retail price tag. If you’re looking to jazz up an office break room, lounge, or studio – the bright colours of the Hisense retro bar fridge may just do the job. 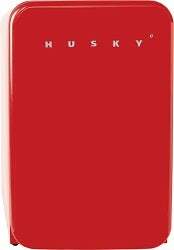 Husky also offers a range of bar fridges in the retro style. The HUS-RETRO-110 model comes in three different colours – Ivory White, Piano Black and Radiant Red. It has 110L capacity and is ideal for small studio usage. It’s also stated to fit comfortably under standard bench tops or as a drink chiller in your kitchen to catch the eye. The Husky 110L Retry Style Bar Fridge features adjustable spill proof glass shelves, a vegetable crisper and a chrome wine rack. Furthermore, it’s designed for indoor usage and has a reversible door for convenience. Expect to pay almost $750 for this retro themed model. Georenje retro fridges come in a variety of colours – Baby blue, Burgundy, Black and Cream. These bad boys are boasted for features such as the ‘IonAir’ technology designed to emulate the natural process of ionization to keep food fresh and the ‘AdaptTech’ system which is claimed to maintain the optimum temperature in the refrigerator, regardless of how often you open the door. 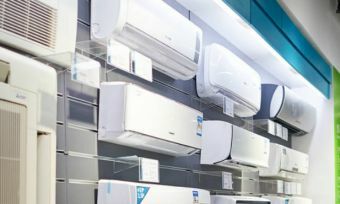 Expect three-star energy efficiency ratings, adding an extra $94 to your annual electricity bill (ONRK192 model based on usage rate of 28.5c/kWh). Is a retro fridge worth the money? Before jumping on the retro fridge bandwagon, you may like to consider if the look is more important than functionality. For about the same price as that of a large 610L side-by-side fridge with a water dispenser, you can get your hands on a retro fridge that’s half the size and has minimal features. While looks are important if you’re wanting to glam out your kitchen space with a standout feature, it’s what’s on the inside that really counts. Think about the features you really need and want, in addition to how your new fridge will look in your kitchen.